Community, transparency, collaboration and innovation are at the heart of the design by EHDD Architects. KQED’s Board of Directors announced that KQED will be embarking on a major two-year renovation project of its headquarters at 2601 Mariposa Street in San Francisco. The redesigned building is the essential next step in KQED’s transformation to meet the changing needs of the Bay Area community now, and for generations to come. Designed by the award-winning architectural team at EHDD, the new building will showcase KQED’s inclusive, community-minded and ambitious vision for the future of public media. Community has always been at the center of KQED’s mission, and is the guiding principle of the new design, which envisions an accessible building that mirrors the innovative spirit of the Bay Area. The dynamic glass facade of the new headquarters reflects KQED’s commitment to transparency. 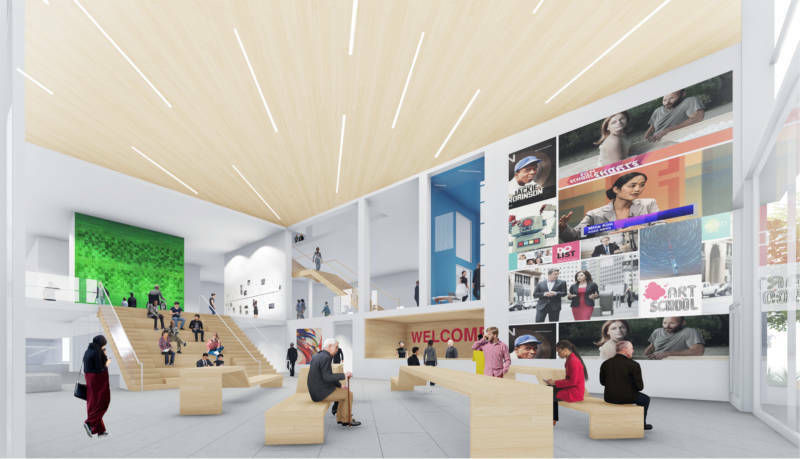 The lifted corner entry, the expanded new lobby and new programming spaces, including a rooftop event space, create a vibrant and welcoming place to convene, connect and engage with all that KQED does. 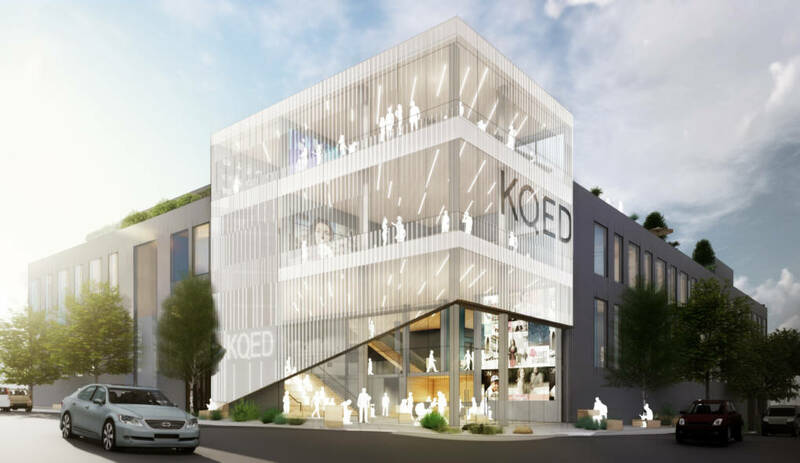 “KQED has emerged as an important convener of community dialogue and our renovated building will include new spaces where the Bay Area community can come in to connect with our journalists, civic and cultural thought leaders and with each other,” says Boland. 2601 Mariposa has been KQED’s home since 1992 when KQED was primarily a television and radio station with 200 employees. The current building reflects the industrial nature of broadcast production at that time. A quarter of a century later, KQED has more than 450 employees with a transformed organizational structure built on cross-platform collaboration, community engagement and innovation. At a time when trust in media is at an all-time low, 2.5 million people — almost half of Bay Area adults — use a KQED service each week. The current building cannot support KQED as it operates now, and as it continues to grow in the future. Reimagined office and production spaces will create an open and bright 21st-century workplace with maximum flexibility. The new layout will be more conducive to collaboration and innovation, and can accommodate up to 40 percent further growth. The KQED Board of Directors voted to renovate the current headquarters, which KQED owns, after a year-long due diligence process. Working with real estate consultant David Polatnick of Polatnick Properties, they explored more than 40 purchase or lease options for buildings and land in San Francisco, Oakland and the northern Peninsula. The board concluded that renovation was the best and most cost-effective option. 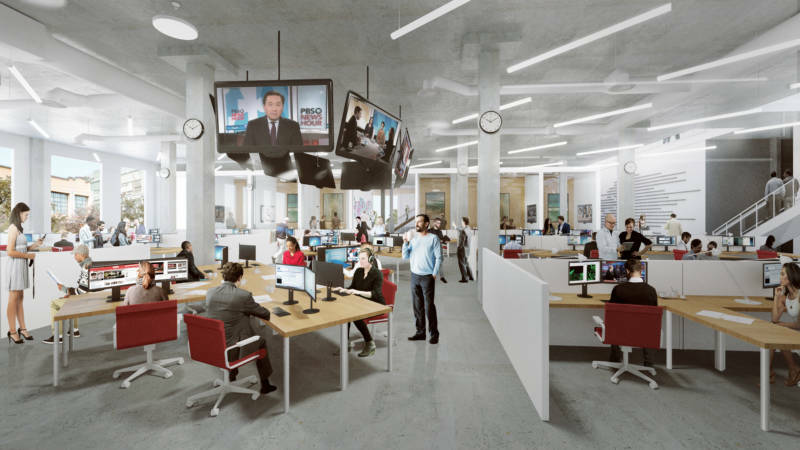 Construction is expected to begin in the summer of 2019 with KQED staff relocating to a temporary office location at 50 Beale Street. The new headquarters will be open in the winter of 2021. All of KQED’s broadcast and digital services will continue uninterrupted during the transition.